Amy is a Cree with Métis lineage from the Beardy’s and Okemasis’ First Nation (BOCN), Treaty 6. 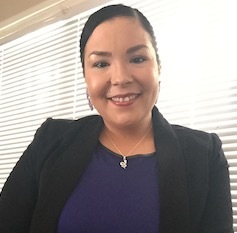 She has been with the OTC since 2012, and has served in various capacities and departments within the organization (Research Assistant, Treaty Learning Network Coordinator, Research Technician, Speakers Bureau presenter and Director of Speakers Bureau). She attended the First Nations University of Canada and obtained her Bachelor of Arts in 2011; majoring in Indigenous Studies and minoring in Indian Fine Art. She worked for, and studied at, the University of Saskatchewan, Dept. of Native Studies in 2011/2012 and took part in a class focused on Residential School history and compiling information and data for the Truth and Reconciliation Commission’s National event at the University of Saskatchewan (June 2012). While at the U of S Amy was also a seminar leader for Native Studies 107 and facilitated Treaty education, Indigenous history and Indigenous awareness classes to students from all areas of study. Amy describes herself as a seeker and sharer of knowledge. She is first and foremost an artist and storyteller, and enjoys reading, writing, painting, beading and most of all, dancing. Amy is the Manager of, and dances for, the Creeland Dancers, and Indigenous dance troupe formed in 1984 and originating from BOCN that specializes in a fusion of Métis jigging and square dancing.